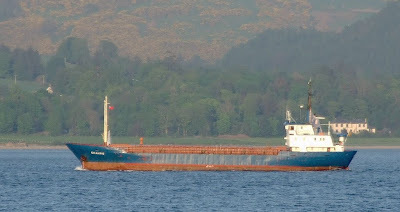 An attractive little ship arrived this evening, the St Vincent & The Grenadines-flagged SKANTIC, which is owned by a Danish company and was inbound from Peterhead. She was built in 1974 at Frederikshavn as SKANLITH, becoming SKANLILL in 1983 and SKANTIC in 1999. With an overall length of 64.62 metres, she has a deadweight of 1,094 tonnes.